Unique wall cling decorations are a cheap and easy way to decorate for any Holiday party this year! Decorate walls, refrigerator, dishwasher, entry, garage door, etc... Why not add some fun and funky holiday pizzazz to any flat non-porous surface? 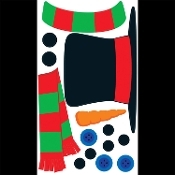 12-inch (30cm) wide x 24-inch (60cm) long create-a-snowman peel n' place sheet REMOVABLE wall decoration. This Frosty themed Snowman will have your party and your house looking great for the holiday season! 1. Peel decoration from backing. 2. Place decoration on desired surface. 3. Remove and reposition as needed. ***Always be sure to test before applying to surface, may leave a mark.